CRISPR gene editing has endured a rough 2018 after years of hype. One start-up, which shares founders and tech with Editas Medicine, thinks it can move the field forward. Regardless of the controversy surrounding who invented what when, there's no disputing that Dr. Feng Zhang has written himself into the history of CRISPR gene editing. In 2013, his lab at the Broad Institute was the first to demonstrate that CRISPR-Cas9 could be used for genome engineering in eukaryotic cells, such as human cells and industrial yeasts. That proof of concept laid the cornerstone for Editas Medicine (NASDAQ:EDIT), which was founded later that year and included Zhang as a scientific founder. Now he's at it again with two other scientific founders from Editas Medicine, although this time around, the DNA editing technology the trio is helping to develop has flown under the radar. That's a bit unusual considering it could potentially address the major technical concern weighing down CRISPR gene editing at the moment: the impact DNA repair mechanisms might have on safety and efficacy. The pioneering companies in the field are certainly keeping an eye on the start-up, named Beam Therapeutics, which is leading the charge for a new DNA editing tech called CRISPR base editing. Here's why individual investors should, too. Privately held Beam Therapeutics launched in May 2018 armed with a formidable portfolio of intellectual property licensed from Harvard University, the Broad Institute, the Massachusetts Institute of Technology, and Editas Medicine. It also grabbed $87 million in Series A funding on its way out the door to develop a next-generation DNA editing tool called CRISPR base editing. So what's the difference compared to CRISPR gene editing? Well, there are four nucleotide bases in the DNA alphabet -- A, T, C, and G -- that encode biological function. Sometimes what's supposed to be an A mutates to a G, or what's supposed to be AGA mutates to AAA. Although small, the change could affect the proper function of important cellular processes, resulting in a disease. CRISPR tools promise to fix these errors, but there's now a growing arsenal of approaches. Whereas CRISPR gene editing aims to cut out faulty genetic material (and sometimes insert properly working material) to fix genetic sequences and treat or cure diseases, CRISPR base editing aims to simply convert mutated nucleotides to what they should be -- no cutting required. It's kind of like having an "undo" button for mutations. Can be used to insert new genetic material into a sequence? Does it trigger DNA repair mechanisms? Data source: Beam Therapeutics, author. For instance, Beam Therapeutics has tools that induce a chemical reaction to change an A to a G, as well as tools for C-to-T, G-to-A, and T-to-C edits. No cuts are made to either strand of DNA, rather, nucleotide bases are changed "in place." That provides the ability to repair point mutations (when a disease is caused by a single nucleotide mutation, such as some forms of cystic fibrosis) or make more extensive repairs involving multiple nucleotides in a genetic sequence. The precision and accuracy of the next-generation CRISPR approach could extend toward a couple of more powerful capabilities, too. It's possible that CRISPR base editing could even be used to protect against disease. For example, CRISPR base editing could lower the risk of heart disease or strengthen a patient's bones by "writing in" protective genetic variations to genes already present. Put another way, CRISPR base editing aims to be the stealthy ninja of DNA editing tech. That quality could come in handy when navigating the risks posed by DNA repair mechanisms. CRISPR gene editing has progressed from proof of concept (2013) to clinical trials (expected to initiate in 2018) in an incredibly short period of time. 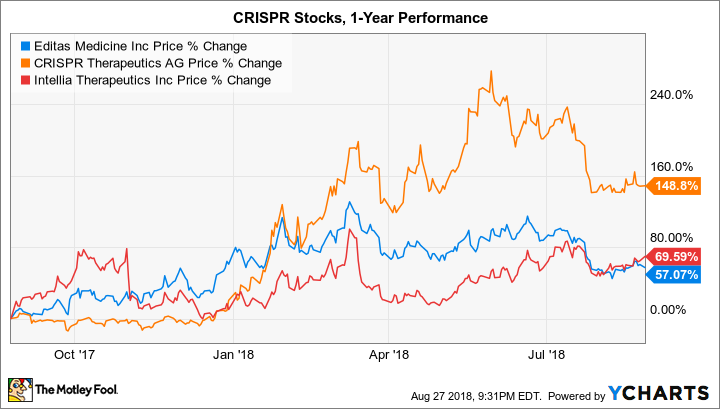 The unprecedented pace of innovation and resulting excitement in the investing community has launched Editas Medicine and peers CRISPR Therapeutics (NASDAQ:CRSP) and Intellia Therapeutics (NASDAQ:NTLA) to valuations over $1.2 billion apiece. But perhaps things have moved a bit too quickly. Since the beginning of 2018, multiple studies have come to light reminding investors that there are still significant unknowns concerning how safe and effective CRISPR gene editing will be in human cells. The culprit each time: double-cuts to the DNA double helix triggered certain DNA repair mechanisms to spring into action. Observations have been made linking these mechanisms to the rise of cancerous cells and making unintended edits to a genome. So, wouldn't it be great if researchers had a DNA editing tool that had the best of CRISPR gene editing without activating either DNA repair mechanism? Well, that's exactly the problem Beam Therapeutics and CRISPR base editing aim to solve. The next-generation CRISPR base editing tools being developed by Beam Therapeutics could get around some of the roadblocks erected by Mother Nature with those pesky DNA repair mechanisms by making stealthy edits to a DNA sequence. The company is still in the process of identifying the first therapeutic targets to send through the ringer of clinical trials, but it noted that it's open to licensing its technology platform for gene targets that external companies might find interesting. That detail might come back around to the forefront for investors as Editas Medicine, CRISPR Therapeutics, and Intellia Therapeutics decide on how to proceed with their own pipelines. And given the close relationship and licensing deals with Editas Medicine, one of the gene-editing pioneers may already have one foot planted in the future.